a situation or condition favorable for attainment of a goal. So what might be stopping you from taking advantage of a favorable time or occasion? I would … if it were only the right time. I would if the economy, situation, recovery, timing, circumstances, or situation were … right! When I reflect back on some of the greatest opportunities in my life, it always seemed like at the time, it was never the perfect time to take action. February 8, 2000. I am sitting on a beach with my mentor overlooking the Sea of Cortez, it’s a turning point in my life. I want to be a professional speaker and yet I am afraid of unlocking the golden handcuffs that had me locked in to a highly paid job that I had outgrown. “September … I will resign in September,” I reply. I was shaking, I was scared. He was challenging me to walk away from my identity, my security, and everything I had worked toward for 17 years! 23 days later I resigned and my life has never been the same! Chances are you have a dream or an idea that you haven’t acted on … yet! Maybe you hear that inner voice whispering that you are not living the life that you want to live or being the person you know you can be. The truth is … there is no perfect time, right time, safe time, etc. There is now! Right now! Right now is the perfect time to make that move, to start that business, to play big, to take a leap of faith, knowing you will succeed beyond your wildest dreams. NOW is an opportunity of a lifetime … you just have to open your eyes and let go of your fear. 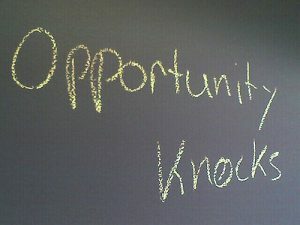 So are you ready for your opportunity of a lifetime?